Singer/Songwriter LeRoy (pronounced le-ROY) Johnson was born at Charity Hospital in the city of New Orleans, sometime in the late 1950’s or early 1960’s (we think). In 2005 Hurricane Katrina flooded the hospital, and it’s record room, causing many old files to go unrecovered and the hospital to remain closed to this day. What happened to young LeRoy Johnson since those early days in New Orleans remains a mystery. Now, freshly out of prison (after 20+ years), with no shortage of rumor and gossip, this mystical musician, who has influenced fans worldwide, is looking for a few final audiences before he heads Home for good. 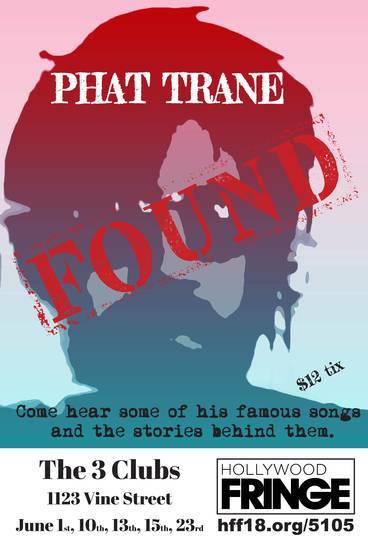 The Hollywood Fringe Festival (June 7th-24th, 2018) is the perfect place to introduce this show and see if we can spread the word about Phat Trane and some of the wisdom he’s slyly been giving to the world while it was busy looking at its phone.